Tom Brady is one of, if not the best quarterback in NFL history. He has won six Super Bowl championships with the New England Patriots and continues to prove all the doubters wrong. As this age, Brady continues to compete at a high level and his record six championships will likely never be matched. Considering just how great Brady is, it's no surprise that it would probably cost a lot of money to purchase an autograph from him. Well, according to TMZ Sports, if you want Brady to sign something for you, it's going to cost you over $1,000. Yes, that's right, Brady is actually charging that much for signed gear. 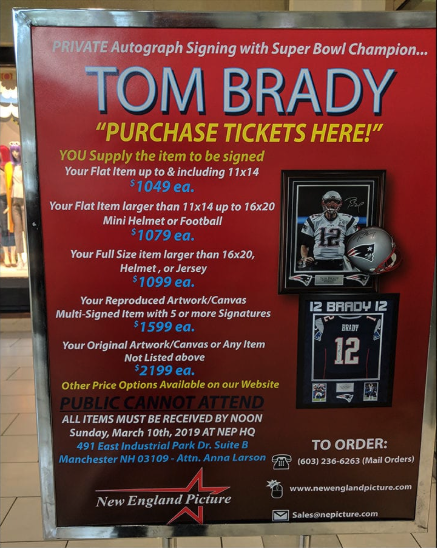 TMZ received an image from a private autograph session hosted by Brady, which displays all of the prices for certain pieces of memorabilia. If you were looking for a signed photo, that would cost you $1049, while a mini helmet or football would cost you $1079. If you had an original piece of artwork that you wanted to be signed by the GOAT, well, you'd be looking at a grand total of $2199. While we love Brady's hustle, $1,000 is a pretty steep price for a signature. Regardless, we're sure there are plenty of diehard Patriots fans out there who would be more than happy to pay the price.